Local instructor Sarah Schwartz leads a yoga pose for the participating group during a session Friday, July 21, at Arapahoe Basin Ski Area. 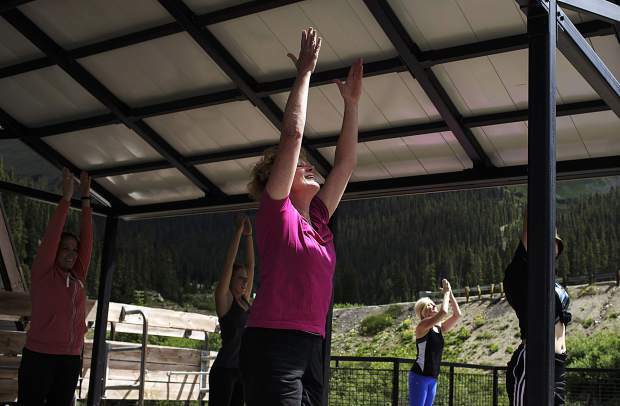 Nancy Bergen, center, and other Summit County residents participate in a yoga session Friday, July 21, at Arapahoe Basin Ski Area. The resort is in its first year offering yoga on Friday mornings to constumers, which lasts until August 18. 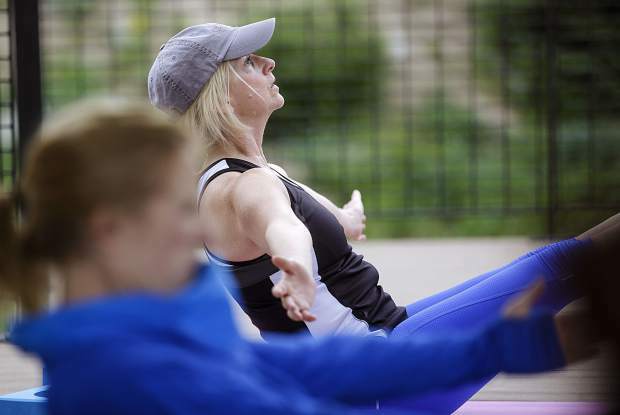 Jennifer Johnson hangs her balance while taking deep breaths during a yoga session Friday, July 21, at Arapahoe Basin Ski Area. 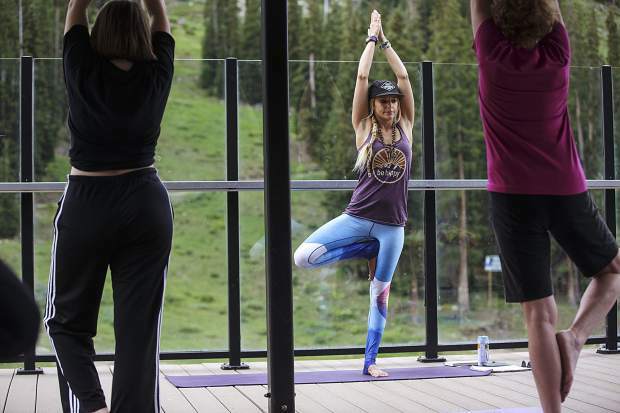 Summit County residents participate in a yoga session led by local instructor Sarah Schwartz Friday, July 21, at Arapahoe Basin Ski Area. 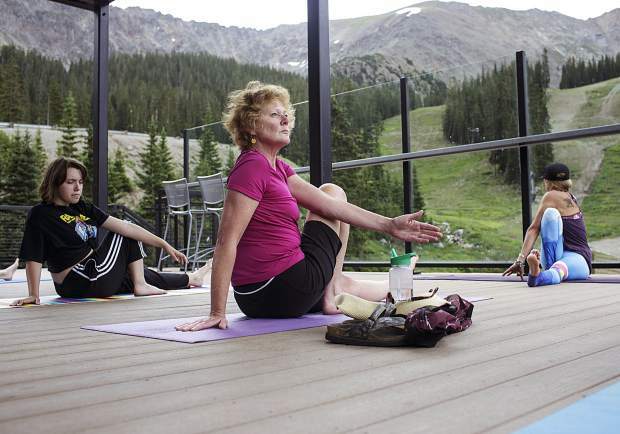 Nancy Bergen, center, and other Summit County residents participate in a yoga session Friday, July 21, at Arapahoe Basin Ski Area. Ashley Ojala, center, and other Summit County residents participate in a yoga session Friday, July 21, at Arapahoe Basin Ski Area. 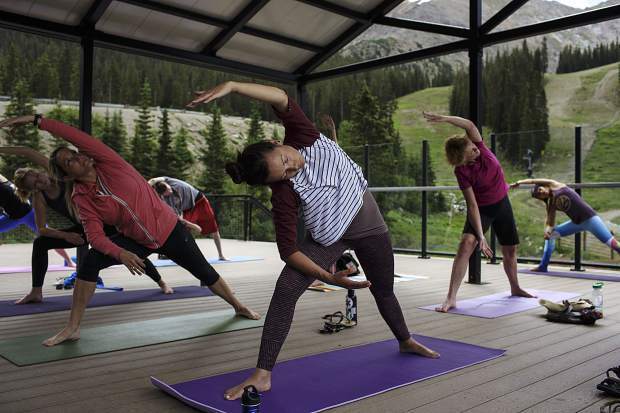 Local instructor Sarah Schwartz, in background, leads a yoga pose for the participating group during a session Friday, July 21, at Arapahoe Basin Ski Area. At 10,780 feet above sea level, a group of nearly a dozen yoga enthusiasts inhale and exhale slowly, surrounded by Arapahoe Basin’s east-facing wall of sheer rocky cliffs and hardy pine trees on Friday morning. The ski resort held its first weekly yoga session for customers who enjoy meditating in the great outdoors without putting on hiking boots. “Outdoor yoga is nice because it feels less pressured compared a studio,” says Sarah Schwartz, who is a local instructor. The one-hour yoga classes are from 11 a.m. to 12 p.m. on Fridays, until Aug. 18, by registering on the resort’s website.